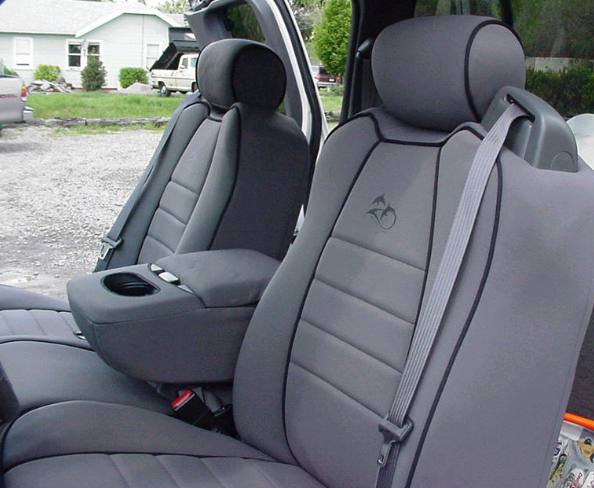 Neoprene seat covers aren’t just another product, especially when it comes to the protection and upkeep of your car or truck’s interiors. For those unfamiliar with what neoprene is, it is considered one of the most stable chemicals in the world. One of its most common uses is in the production of wet-suits that divers use to delve deep into the murky depths of the sea. Capable of withstanding hundreds and thousands of pounds of pressure, divers can explore greater depths under this material’s strength. 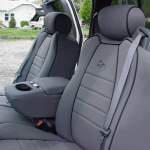 For your vehicle, that kind of durability is more advantageous than standard run-of-the-mill seat covers. High temperatures, no problems: When temperatures rise to 100 or 110 degrees, the feel inside of your vehicle can be closer to 140 or 150. Deal with that using leather interiors, and the sensation can be similar to sitting down inside of an oven. Neoprene seat covers stave off Mother Nature’s anger during the warm months by acting as a lower-temp material that helps you adjust as your car’s A/C kicks into high gear. Unbelievable insulation: The chemical from which Neoprene seat covers are derived is often used for insulation, thus creating a cooler environment in the summer and a warmer one in the winter. Not only do your vehicle’s natural seating materials get protection, but the efficiency of your car or truck’s central heating is enhanced. Protection from the elements: Neoprene seat covers offer easy clean-up as another attractive feature, which comes in handy the more time you spend around the outdoors. Taking the kids to and from soccer practice, driving Rover around the neighborhood, or simply tracking in dirt and grime from your job or other activities, are all easily handled. Shock protection: Add another layer between you and the road. With Neoprene seat covers, you can not only rely on your vehicle’s natural suspension, but you also have a material covering your seats that is commonly used for shock absorption, producing extra comfort on top of protection. All seat covers are not created equally. Whether choosing neoprene or not, keep this in mind before making your decision.